FINALLY, here are the specific directions on all 4 of them. 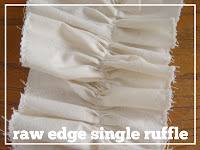 You will see this ruffle has a faux raw edge, as you really are going to zig zag stitch down the two sides of the ruffle. This will make it so it will not unravel, but it still has that raw feeling. 1- Take your strip of fabric.. (this is what you have to figure out on your own...I had strips 4" all the way up to 9" wide to start out..some I made into tubes, others I left alone...I think a good rule of thumb is to have a good mixture. The length of the strip will depend on the size of your duvet. Usually I made my starting strip be about 3-4 times the size of the ruffle I was putting down. 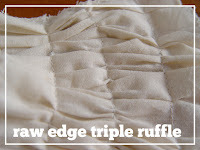 )..and zig zag stitch along the outside of your ALL of your raw edges. For those who haven't sewn a zig zag stitch, I just placed my width at the highest setting, and my length I kept at about 2.5. All machines will vary..most now will have a simple zig zag stitch function. I like my zig zags to be closer together, but wider, so that is the setting I went with. When sewing a zigzag stitch, keep your material going through the center of your foot (see image 1) 2- This is what your edge will look like when you finish stitching it. 3- Now to the ruffling. I ruffle simply by pushing more fabric through the foot than what it normally grabs. Keep your fingers moving, and remember..ruffles do not have to be perfectly spaced! If you bunch more at one part than another..no big deal. 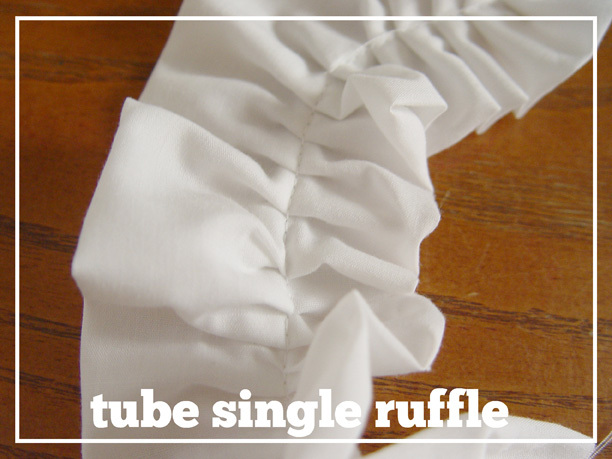 The more ruffles you do, you will find your own technique that works best. As I push the fabric through, I simply keep sewing at a slow speed..the more I have done, the faster I can go! 4- Keep sewing a straight line through the center of the strip until you are done. The finished strip should look like the top picture! 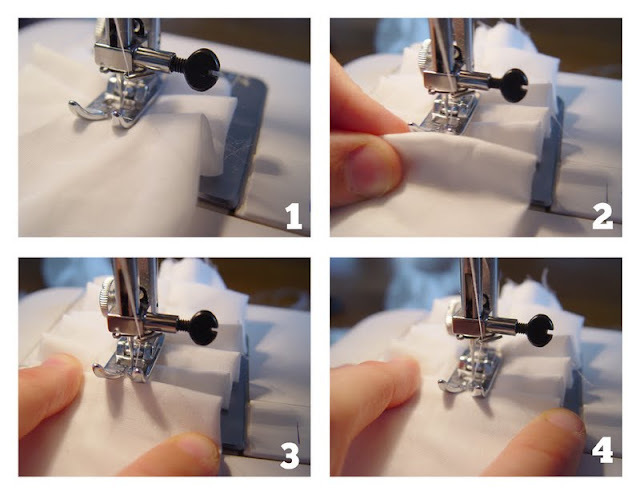 1-After sewing the middle line through the center, go to the right of the center line to the middle from the edge to the center and start sewing again. 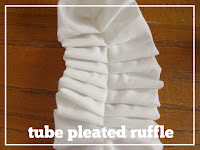 I like to make this ruffle a lot wider, so you may have to ruffle just a little as you push the side seams through, but mostly just let the machine do the work! 2- After doing the right side, I turn it upside down (not over) and stitch the other side the same way. 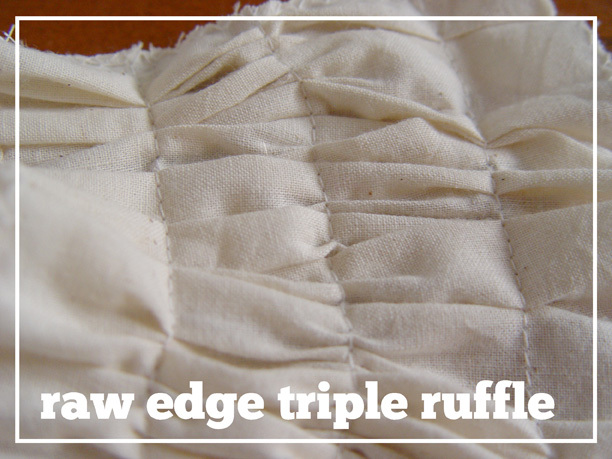 When you finish there will be 3 lines down your ruffle. When sewing this on to your duvet, sew over the center line! These ruffles are easiest sewn on strips 6" or bigger, though I did use a few 4" strips on my duvet cover for added volume! 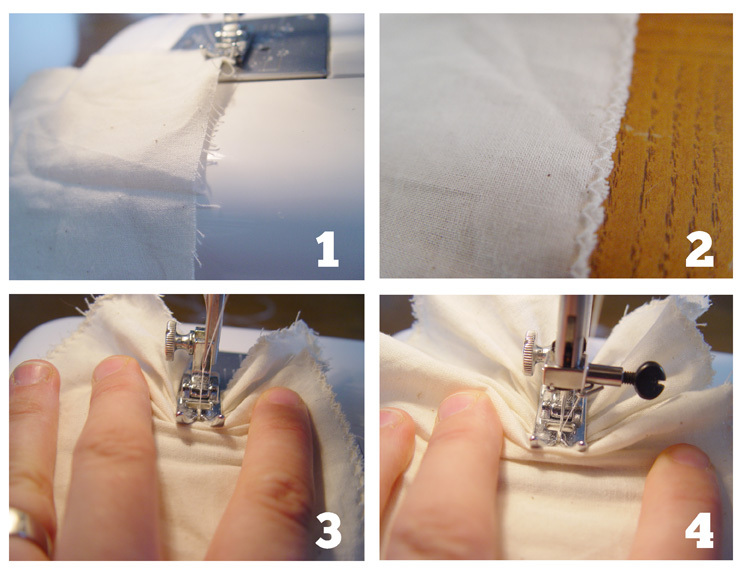 Start sewing and once again, push more fabric through faster than the machine will feed it! 5, 6- the faster you feed it the more ruffles you will have, the less, the more spread out your ruffle will be! Note that these ruffles will be harder to push through as they are thicker! However, having various sizes of these really adds a LOT of volume to your duvet cover! 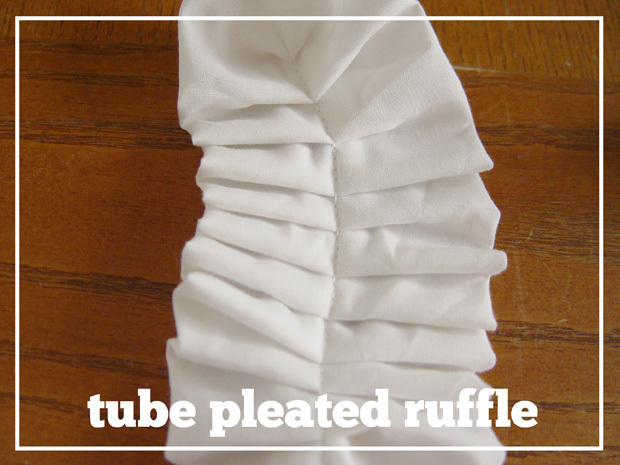 You will notice that this one has fairly even ruffles and this is achieved by pleating the tube. And there you have it. I did 12 rows of ruffles on my duvet cover of varying widths and ruffles and it came out, just as I wanted it! Yay! Now go and make one and send me a link! I'd love to have a party in a few months and feature YOUR duvet cover. Once you make one, send me a link and I will keep it on file! If you have sent me one before this, I would just ask that you send it again and I will file it away this time! :) Thanks for being so patient with this tutorial! 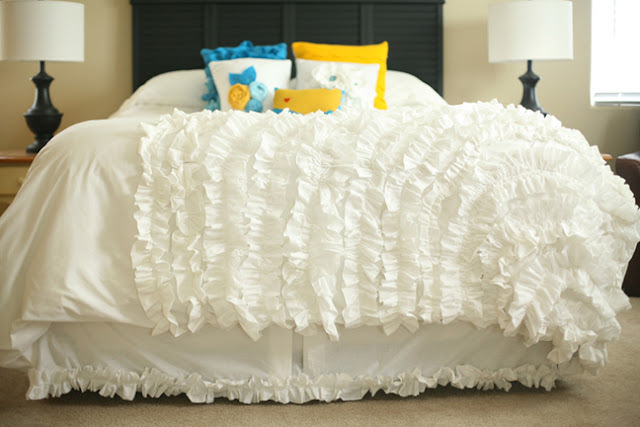 To find the DUVET TUTORIAL click here. To find my BEDROOM MAKEOVER, click here. Oh I am so excited :) Thank you!!!!!! Thank You so much!! 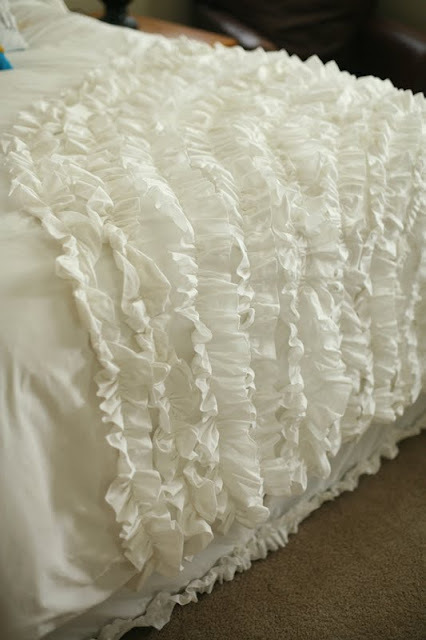 i am going to be using your guidance to make the entire comforter ruffles (like the other Urban Outfitters ruffled duvet). I'm totally regutting my bedroom and I have you to thank as an inspiration :] I'll post pictures on my blog as soon as I'm done (hoepfully starting this weekend). I was one of those hundred emails and I'm so glad you got the tutorial up! All of my material is here and ready to go and I will be starting on mine tonight! Thanks so much, you will def be getting a picture from me when it's done! This is SO fabulous!!! I've had my eye on the rose colored duvet for a while now, and I am beyond impressed that you made your own version. You are quite talented my friend! Just gorgeous! 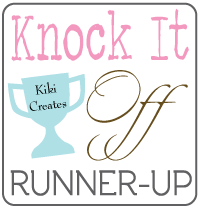 I linked this to my ruffles post too, well done! YAY!!! I just got my ruffle supplies today so hopefully I'll beagle to bust out a duvet soon! Thanks for the awesome tutorial! I will share when I'm done! 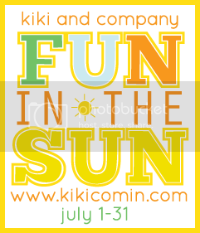 very cute love it..i want to do that on a tee shirt so that just maybe helpful. 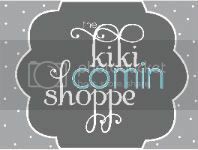 forund you through pinterest...great blog. Oh, I am in LOOOOOOVVVVEEE! This is just gorgeous. I just saw one online but they were all sold out and here you have made your own and exactly like the one I saw. thanks a ton, I know tutorials are a lot of work. Another easy way to ruffle that I've used is to put your machine on the straight stitch. Then put the length to the highest setting (a 4 on my machine), and put the tension up to the highest setting (a 9 for me). 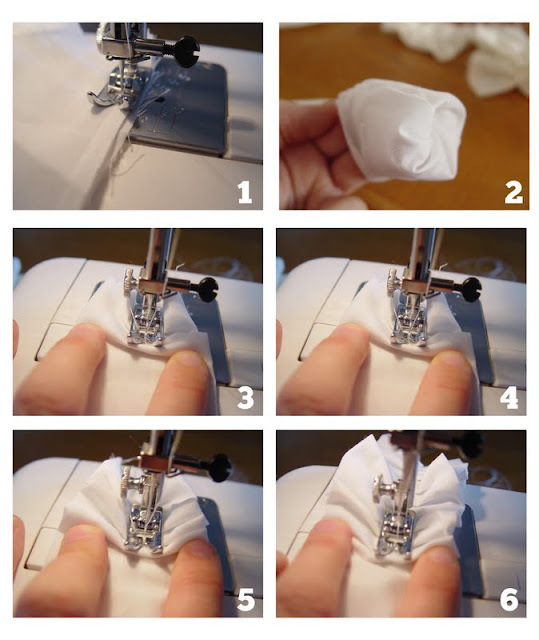 You don't reverse stitch at the start or finish so that you can ruffle the fabric more or less. Hope that makes sense. Really awesome tutorial. I love the finished product!